Soft Skull Press, 9781593763077, 176pp. In Republic of the Congo, in the town of Trois-Cents, in a bar called Credit Gone West, a former schoolteacher known as Broken Glass drinks red wine and records the stories of the bar and its regulars, including Stubborn Snail, the owner, who must battle church people, ex-alcoholics, tribal leaders, and thugs set on destroying him and his business; the Printer, who had his respectable life in France ruined by a white woman, his wife; Robinette, who could outdrink and outpiss any man until a skinny-legged stranger challenged her reign; and Broken Glass himself, whose own tale involves as much heartbreak, squalor, disappointment, and delusion. A brand-new edition of an irreverent, allusive, scatalogical, tragicomic masterpiece from one of our greatest living Francophone writers. Alain Mabanckou is a novelist, journalist, poet, and academic. A French citizen born in Republic of the Congo, he currently lives in Los Angeles, where he teaches literature and creative writing at UCLA. His books include African Psycho, Letter to Jimmy, Black Bazaar, Tomorrow I'll Be Twenty, The Lights of Pointe-Noire, and Black Moses. 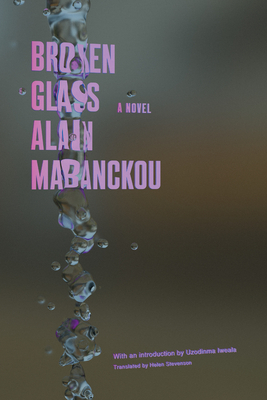 Mabanckou has twice been a finalist for the Man Booker International Prize, in 2015 and 2017.